With the first homes being built in the New England area, specifically Cape Cod, MA, by English settlers in the 1700s, Cape Cod house plans are deeply rooted in American history. They were basic structures that contained only a single room or a couple of rooms. The chimney was placed at the center of the floor plan so the entire home could be warmed throughout the harsh New England winters. Original Cape Cod homes did not contain bathrooms and most did not provide a kitchen either. Typically, the exteriors of these houses offered very little exterior ornamentation reflecting the Puritan values and sentiment of the early East Coast settlers. The homes were usually symmetrical with clean and simple lines and an exterior covering of shingles or clapboard siding. Steeply angled roofs helped protect against the stormy weather characteristic of the Cape Cod area. 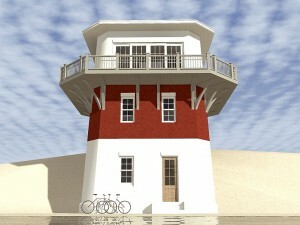 In the 1930s Cape Cod houses became popular again. These simple and easy-to-build structures appealed to Depression Era builders and thus were mass produced due to their small and economical size and efficient features. Furthermore, they were quite affordable to build and became popular with home buyers as a result of their very affordable prices. Their practical floor plans were an added bonus. After World War II, Cape Cod style houses began popping up all over the United States in an array of variations from their original design. Today’s Cape Cod house plans maintain their simple and symmetrical nature showcasing an exterior with clean, straight lines and little exterior detail and trim. Windows and the main entrance are neatly arranged across the front of the home. Designs can be one or two stories. Like their ancestors, they feature a steeply sloped roof with little overhang. Today’s Cape Cod designs often offer a loft or full second floor with a couple of bedrooms tucked inside the roof. Often, protruding dormers increase headspace and usable area on the upper level. 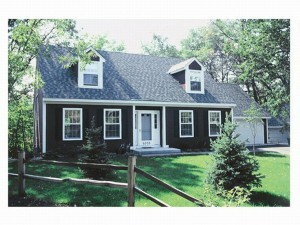 Present day Cape Cod home plans continue to offer a functional floor plan and practical features. They incorporate many of today’s most requested design elements into their historically popular floor plans such as a kitchen island, walk-in closets, deluxe baths and specially appointed rooms like an office or study. Furthermore, their simply design makes them highly expandable with some popular versions offering an attached garage or basement foundation. The practical floor plans, functional features and budget friendly price of these New England style homes make them especially appealing to young families with one or two children. From the past to the present, with promise for the future, Cape Cod house plans are a timeless American classic. True to its New England roots, this Cape Cod house plan displays an array of exterior features that have graced America’s landscape for hundreds of years. A siding façade and shuttered windows give this home a simplistic look, characteristic of the style. The steeply sloped roof with side-end gables and charming dormers replicate the homes of long ago, designed to withstand the stormy weather of the New England seaboard. But don’t be fooled, Cape Cod home plans like this one are now commonly found throughout out the United States and Canada from coastal areas to the Great Plains. Now take a look inside. The side-lighted entry welcomes all where the foyer greets guests. The formal living and dining rooms are positioned at the front of the home offering the ideal arrangement for entertaining and hosting special dinner parties. A fire place anchors the living room and a notable chimney highlights the exterior. The casual gathering areas are positioned at the back of the home. The open floor plan encourages conversation and relaxation while delivering efficient family living. Take a look at the gas fireplace and the rear porch with sliding door access from the family room. Notice the strategic positioning of the kitchen serving both the dining room and nook with ease. The 2-car, side-entry garage holds the laundry facilities. A private bath enhances the first floor master bedroom. Upstairs, two family bedrooms boast double closets and enjoy the views from the dormer windows. A timeless classic, this Cape Cod house plan is sure to please you and your family. 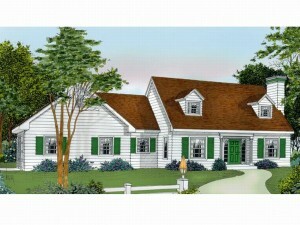 To view more house plans in the New England style, please visit The House Plan Shop. Originating in the 1700’s, Cape Cod house plans are deeply rooted in America’s historical past. They express the style of the New England Seaboard and are designed to withstand the stormy weather of the area. 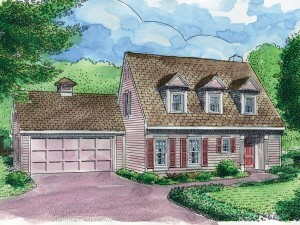 Just like those from long ago, Cape Cod home plans are simple in design. Below is a list of qualities and characteristics common among these timeless and classic designs. Cape Cod house plans are one of the first home designs built by settlers in the New World. These homes were constructed in many parts of the New England area and quickly became associated with Cape Cod, MA giving them the name we still use today. They are designed with a rectangular or symmetrical, boxy floor plan. The exterior often features a centered entry door and simple or little ornamentation such as window shutters only. Cape Cod home plans often display exterior finish and trim of wood shingles or clapboard siding. A steep roofline accented with dormers and side gables to help protect against stormy weather characteristic of New England’s coastlines is one of the most noticeable exterior features of these homes. The floor plans are generally arranged with the main living and activity areas on the first floor off a center hall. Cape Cod floor plans usually feature at least one large, open gathering area anchored by a fireplace. These designs can be one or two levels. They are designed for efficient family living. In two-story homes, it is typical for all bedrooms to be positioned on the second floor for privacy. Hardwood flooring is a distinguishing interior characteristic of Cape Cod style homes. They range in size with a varying number of bedrooms and bathrooms. Cape Cod houses are sometimes referred to as 1 ½-story homes or saltbox home plans. Designed with careful planning and thoughtful design, many of these homes blend nicely with other Waterfront designs. Beach and Coastal homes and Colonial floor plans share some recognizable similarities with Cape Cod house plans. Today, they are built throughout the United States and Canada along coastlines and inland bodies of water and even in landlocked areas. Gracing our past, present and future, these New England house plans are a popular choice among homeowners for their efficient floor plans, affordability and practical layouts. Take some time to browse The House Plan Shop’s collection of Cape Cod designs to find the right one for you!